Great job! I like the insight you have put into writing these article. Keep it up. Nice work. A luxury bus network is needed to keep car owners off roads. This web site is really a walk-through for all of the info I’ve wanted about this and didn’t know who to ask. BEST should go the BMTC way and flood the roads with Volvos. Then only will we see good response to AC services. TMT should take over AS1 and AS13 from BEST. I like NMMT buses. They’re better. It is indeed very sad to know that BEST is phasing out its AC services. These buses were the joy givers back when I was a kid. A2 from World Trade Centre to Oshiwara Depot! Nostalgia. 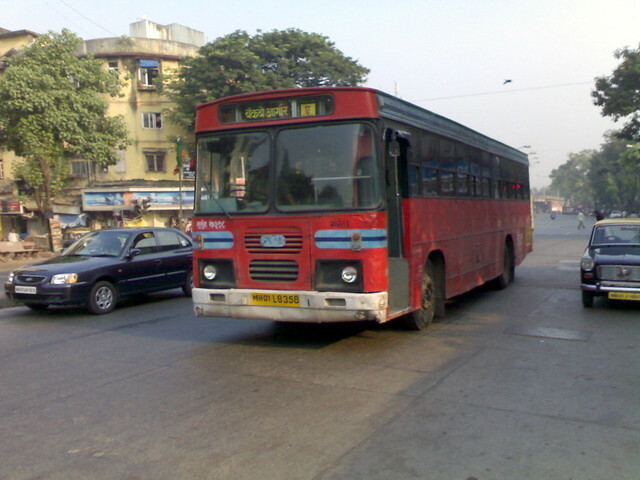 These days one can see NMMT 131 with a board saying Borivili East to Thane East. Has the NMMT really sunk so low? Why isn’t BEST or TMT doing anything about it? BEST needs to get rid of this stupid AC non-AC divide and make all buses AC. At this moment I am going by AS-422, but now I am taking TMT new bus 125.
best need to get rid of their kinglong(damn who gives this bus ‘king’long name).I lives in borivali area in mumbai.everyday I see as-700 goes without passangers,just conductor and driver in it.seriously why to continue ac buses on this route.If even they can buy at least 50 volvos they can give hars time to nmmt and tmt.They should scrap all ac buses and start new non ac buses from ashok layaland(red indicator bus ).At least they can get regular passangers. 1. None of the Volvos have slave engines for AC. Simple reason for their superior performance is powerful engine & robust engineering compared to the jugaad Ceritas. 2. Just calculating the number of stops doesn’t decide the fastest bus. The speed at which bus travels IN BETWEEN the stops also matters. Here is where the Volvos beat the Ceritas hollow. Even an empty Cerita cannot come close to the performance of a Volvo loaded with 70-80 passengers. 3. You missed an all important aspect – Fare. BEST charges more than 1.5 times the fare of NMMT/TMT for their Ceritas and offers nothing in return. This is the single biggest factor which has led to drop in patronage of Ceritas in the last 1 year. No amount of new routes will work unless BEST fixes the 2 most critical aspects – their pathetic buses & sky high fares. I can give an example for this. They recently started a new route from Bhayander to SEEPZ. There is no reason for this route to go wrong. But still, it was shut down in 3-4 months due to low patronage. Reasons are undoubtedly the two I mentioned. Number of stops is super crucial for one main reason. Less deceleration. Lesser deceleration implies a constant speed which matters. At the end of the day, Cost is NEVER a super crucial matter. People pay more for an UberBlack than an UberGo, when both are ultimately the same. Which is why BEST needs to start improving their AC fleet. A better fleet, coupled with BESTs ETMs and Prepaid card will definitely give BEST an added advantage over NMMT. Why is OP Gupta not doing anything? When he handled MSRTC, he beautifully turned a loss making entity into a magnificent, super profitable, top class service. That would make a difference IF the bus is competent. The Ceritas are so bad that they cannot take advantage of all that less stopping stuff. I regularly travel from Borivali to Powai. NMMT Volvos take around 10-15 minutes lesser than BEST Ceritas to cover the distance. Previous Previous post: 26 July: Did we learn anything?